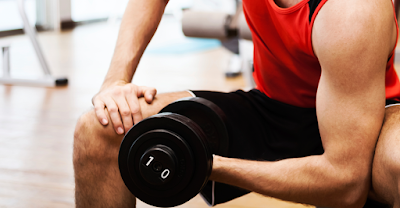 Weight lifting is a common physical activity used for strength training. Strength training is a type of exercise which specializes in resistance training to build muscle strength and size as well as increase endurance. Besides building strong muscles, strength training offers several other benefits for both men and women, and especially for people above the age of 50. For individuals seeking to improve their overall health, fitness, and wellness, strengthening their muscles should be a top priority. First of all, strength training and building strong muscles can help an individual lose weight. Exercising in general is a great way to burn calories and improve fitness levels but, muscle tissue can burn as many as 15 times more calories per day than fat tissue, including during rest. Strength training also improves your metabolism. Muscle tissue requires more calories than fat to be maintained. After completing a strength training workout, the body will have to work harder than normal to repair muscle strain, burning more calories even long after finishing the workout. Building strong muscles can also help protect an individual’s joints, especially the back. An individual with a sedentary life, frequently experiences joint and back pain as a result of muscle weakness that often leads to stiffness. In a majority of cases, muscle weakness and stiffness can cause injury if the mobility of the muscles reach beyond their range of motion. But, when the muscles are stronger, the body places less pressure on the joints and connective tissue during physical activities, including exerting activities such as weight lifting. Building strong muscles to relieve strain on the joints is also essential for preventing and/or treating arthritis. Also, building stronger muscles can help improve an individual’s posture. Strong muscles ultimately help pull the muscle tissues supporting the back, helping prevent a slouched posture. Strength training can greatly benefit individuals as they age, helping to prevent injury or certain conditions. As we age, the body undergoes natural physical changes, such as degeneration of the joints, causing the development of certain health conditions, such as a degeneration of the spine or arthritis. Maintaining and improving physical strength helps keep the body strong and flexible, avoiding conditions as a result of muscle stiffness and weakness in the long run. Building strong muscles through strength training is essential towards maintaining overall health, fitness, and wellness. It’s crucial for individual’s who live more sedentary lives to become more active and improve the condition of their muscles and other structures of their body. By learning how to participate in strength training workouts, a majority of individuals can ultimately benefit from their body’s natural functions in order to prevent, improve, and maintain, their ideal fitness goals.